The funeral industry as we know it now in America allows for some of the greatest examples of both human graces and disgraces. The disgraces are all too publicized, and rightfully so. Most of us may remember the 334 bodies found in the back yard of the Tri-State Crematory in Georgia. Instead of fixing their retort, the crematory simply placed the bodies in the back yard to decompose and in place of the actual cremated remains, they gave the families boxes filled with wood chips, cement powder and wood ashes. Many of us have seen the Nightline reports where funeral directors were caught bypassing laws on a regular basis, trying to scam money off of the elderly and acting more like greedy salesmen than compassionate professionals. Unfortunately, there are many funeral directors who are all too willing to use disadvantaged people to their own advantage. It’s ugly. It’s exploitation at its most base level. Yet, it happens. The unfortunate result of mixing grief clouded minds and greed poisoned hearts. But, there are those of us who work hard, with undying honesty and integrity, sweating yellow tinged stains on our white collars. We withstand the sweat rolling down our backs into our cracks on the hot summer days as we stand in the caustic sun at the graveside. My great grandfather used to mow the funeral home yard in his shirt and tie. We’re probably still the only practitioners who ask for winter suits … they only make the medium grade suits today because white collar workers just aren’t out in the cold. Our backs are one of the main occupational hazards in this industry. And we get dirty too … crimson red on a bright white cotton shirt. Our collars may be white but our hearts are bleeding blue. There are those funeral directors who see their profession as a calling; who find a sacredness to their calling, as though there was something spiritual about their work. As though they are more so ministers than death merchants. They are understanding, compassionate, hard-working, service oriented people who are more concerned about the richness of life in death then the wealth of their bank accounts. There are those who give their services for free to the less fortunate and downtrodden. Those of us who push families to buy caskets under their financial means instead of over. There are those of us who go above and beyond our contract expectations; who spend that extra five hours making the car accident victim viewable so that the family can see him one more time. There are those of us who offer more than just pre-need and at-need services … those of us who are there for the family months after the fact. There are those of us who understand that our integrity and honest direction can make Death a lot less hard for a whole lot of people. The ancient and famed Egyptian embalmers understood that to be good death practitioners you also had to have religious and moral over and under tones in your life. And although we don’t divine like Egyptians, there are those of us who view this profession first as a practice of spirituality and secondly as a business; and, who do both with a strong work ethic. That’s the mold that I’m trying to fit into. A blue, white and clerical collar. 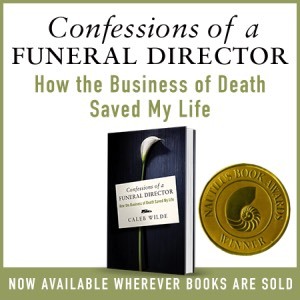 This entry was posted by Caleb Wilde on April 30, 2013 at 10:55 am, and is filed under Funeral Directing, Thanatology and Theology. Follow any responses to this post through RSS 2.0.You can leave a response or trackback from your own site.